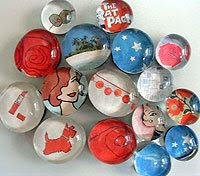 I love, love, love all things handmade. So for this Tutorial Thursday... make something. Great apron for the new sewer. Simple, cute, no sewing required. Yummy paper + mod podge = happiness. Make your fridge happy with these magnets. Got a tutorial you love? Send it my way. I would love to try it out. The craft A.D.D. monster needs to be fed new ideas every day for survival. Great ideas! I love the easy apron tutorial. And I am loving the new look of your blog! I've been looking for a tea towel apron tutorial-the tea towels at Target are so cute!! Thanks for the link! I love the clips - well, and most everything you do. 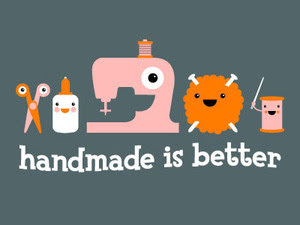 Great post- I'm totally with you, handmade is better! LOVE IT! 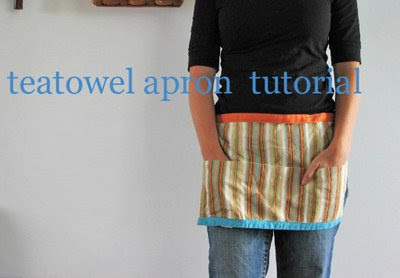 I love the tea towel apron! Your blog is amazing and I look forward to it all the time. I love all your ideas and inspirations. I need to make those clips right NOW! Obsessed! Just found some awesome tutorials recently on this girl Angie's blog. Here is the link to one of her tutorials for a fabric covered diaper wipes case. So fun and easy. I would modify it slightly by putting French gimp around the edges instead of ribbon, but it is all personal preference. Duh, forgot to leave the link.